Boundaries: Lamar Blvd. to San Antonio St. and 9th St. to 3rd St. The heart of Market District: Intersection of Lamar Blvd. to 5th St. and 6th St. The Market District is a newer part of Downtown Austin where you can eat, shop, live and play in a new and exciting environment. Many architects worked diligently to provide an area of the town to be quite catching to the eye. The Austin Market District will lure you in if you are a parent, past Woodstock audience member, a current hipster or just a regular old guy or gal wanting to experience something fresh and new. Many popular gyms in the Market District have been built offering every amenity imaginable. To add to a healthy lifestyle, the corporate office of Whole Foods in the heart of the Market District has been built which also includes a Whole Foods Market store. This has multiple stories of organic shopping in addition to a couple levels of garage parking. Athletic clothing shops in the Market District like LuLuLemon Athletica invite their favorite Yoga studios of the week to teach Yoga and Pilates on top of the Whole Foods Pavilion. Several Austinites relax, jog and bike in this newly refurbished part of town. 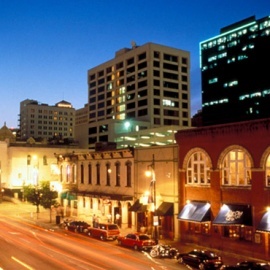 Check out several different types of restaurants, bars and clubs in the Austin Market District. Whether a resident or just vacationing in Austin, the Market District will give you the most exposure to live music, exceptional food and healthy living, providing everything you need to enjoy your life or vacation stay to the fullest.